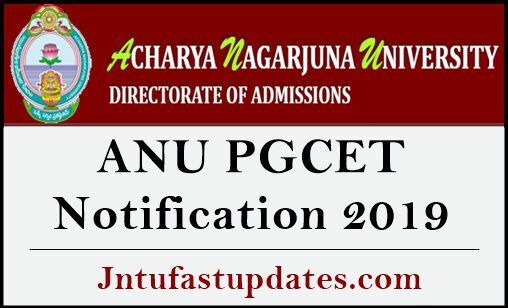 ANU PGCET 2019 Notification, Online Registration, Exam Dates available at www.anudoa.in. Candidates can check syllabus, previous question papers, application, Admission Information Brochure, Instructions to fill Online Application below. Acharya Nagarjuna University. Guntur invites applications for the admissions into Post Graduation Courses offered on its Campus. PG Centre, Ongole and its Affiliated Colleges for the academic year 2019-20 through ANUPGCET – 2019. Details of courses offered. eligibility conditions etc. are available in the Information Brochure. The Information Brochure and Online Application are available on the website www.anudoa.in/ www.anu.ac.in. The application form can be filled Online after going through the instructions therein. The above fee can be paid through SBI I-Collect; Payment Gateway Credit or Debit Card. For more details about ANU PGCET 2019 like syllabus, previous question papers, print application, Admission Information Brochure, Instructions to fill Online Application: http://www.anudoa.in.